801 Mt. Vernon Place NW, Washington, DC. Learn about the convention center’s Environmental Initiatives. Monday night’s Keynote Banquet will be taking place at Hotel Monaco, located at 700 F St NW, Washington, DC 20004. The locations of the Monday night networking dinners will be sent directly to registrants for the networking dinners in advance of the meeting. Hotels are selling out so BOOK NOW! We regret to report that the Hampton Inn has sold out over the dates of the Summit. Many of the hotels convenient to the Walter E. Washington Convention Center are also sold-out or nearly so. Given this situation, we recommend that anyone who has not yet booked lodging use a discount travel provider (Expedia/Orbitz/Hotels.com) or try out Airbnb to secure accommodations immediately. We apologize for any inconvenience. Hampton Inn & Suites is COMPLETELY SOLD OUT! 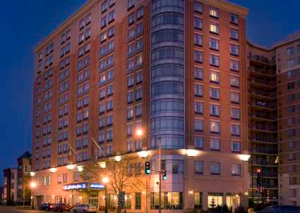 SPLC has reserved a block of rooms at the Hampton Inn & Suites just two blocks from the convention center. In addition to being one of the more budget-friendly options available, this Hampton Inn has earned a Silver GreenLeader rating by TripAdvisor thanks to the environmental practices outlined here. Amenities: Complimentary wifi (check! ), plus many more.